Just over 48 hours after the conclusion of the successful inaugural Ravenscroft CI World Championships of Ping Pong qualifier, the island's top players were back competing in an open tournament with the traditional equipment. Phil Ogier (pictured) had finished third in the Ping Pong showdown, but he was the man to dominate the Lions Club Spot for Sport tournament. The event will be remembered for the fact that the opening match of the tournament also turned out to be the final game as Ogier beat Joshua Butler in a four-game final, having earlier lost in straight games to the 18-year-old during their Group A clash. Butler has struggled for form during league action this season and found himself outside of the seven seeded players who each headed up a group and this was the reason behind his early encounter with top seed Ogier. Ogier last picked up this trophy three seasons ago and was surprisingly dispatched in straight games by an inspired Butler performance. This trend continued throughout the remainder of the evening for Butler as he powered his way to the final, dropping just one leg along the way. 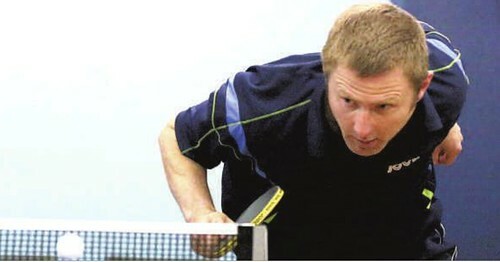 His opponent in the quarter-finals was the fifth seed for the event and fellow Lions player, Liam Robilliard. Butler's energy and form proved too much for the older player and Butler cruised through to the semi-finals without loss. His opponent here was third seed Paul Hainsworth, who had earlier seen off Division One opposition in the form of Alex Robinson and Lawrence Stacey in the previous knock-out rounds, both in four games. Butler's good run continued here as he came through the opening two ends with relative ease. Hainsworth battled hard to prevent a straight game defeat and edged the third 13-11, however Butler had far too much quality on the night and cruised through the fourth to reach the final. decider, but it looked like game over with Stacey holding multiple match points at 10-7 in the decider. Ogier is well renowned for his fighting spirit and he saved some of his best table tennis of the match for the final few points, reeling in Stacey before finishing it off 12-10. In the quarter-finals he came up against the rising 13-year-old talent, Ben Foss. who performed well and took the third game, however Ogier had too much in the tank and came through in four. In a match usually only seen in tournament finals, Ogier met the reigning CI Open Top 12 champion Garry Dodd in the semi-final and Ogier again found himself up against it facing a 2-1 deficit. But he eased through the fourth before taking an edgy deciding game 11-9. As is often the way in sport of all levels, should players meet more than once during the same competition, it is often the player that lost the earlier encounter that comes through the repeat match and Ogier made absolutely no mistakes having earned his opportunity for another crack at Butler. The opener left off where the group match had finished with Butler opening up a lead after pinching it 13-11. Ogier was undeterred by the first end and he proceeded to power through the remaining three ends for the loss of just 14 points.